It's time to breathe some new life into our skirt arsenals, no? One particular style we've been eyeing as of late (and can't wait to wear with everything from sneakers to white booties)? Seventies-esque suede skirts that come in various lengths, colors, and designs. Our favorite thing about this specific style of skirt is that it can easily be dressed up or down depending on your top and shoes of choice. Pair it with a white turtleneck bodysuit and cowboy boots for a cool fall look that hits on some of the biggest trends of the season, or swap the boots for pumps for an ensemble that's office-ready and oh-so-chic. Ready to invest in the piece? 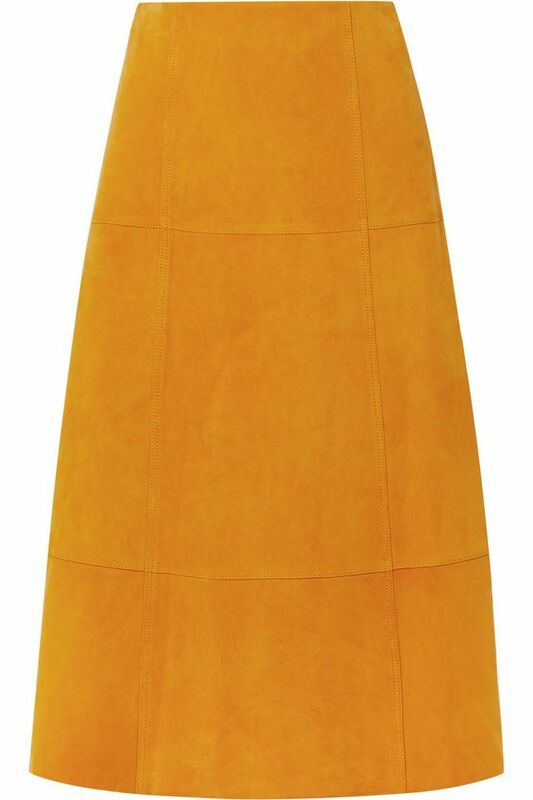 Read on to see and shop 25 suede skirts we're head over heels for. Our new favorite suede skirt. Pair this chic suede skirt with white sneakers. How stunning is this green? A sleek black skirt is a must-have. Of course, Zara has the perfect suede skirt. This suede skirt has us speechless. It's easy to see why this one has a low-stock alert. This one's almost sold out! Style this suede skirt with combat boots. The button-front detailing on this one is great. Check the knot detailing on this one. Wait till you see the lace-up detailing on the side of this suede midi skirt. High-slit skirts are another style we're loving. Check the studded-star detailing on this suede skirt. We're super into the wrap-effect silhouette on this skirt. Style this one with an oversize sweater or a fitted long-sleeve bodysuit. You can wear this one with everything. How fun is the patchwork design on this one? Next up, shop the best fringe skirts to wear this season.